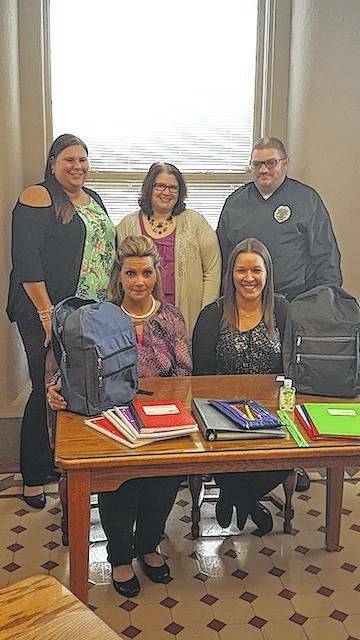 MOUNT GILEAD — For the 2nd year in a row, the Morrow County Juvenile Probation Office is helping students in need of school supplies. In 2016, Quality Assurance and Grant Coordinator Amanda Wheeler applied for a grant that would address youth in the county that do not have the means to purchase quality school supplies. This grant, through the Ohio Department of Youth Services, has permitted Juvenile Probation Officers to give youth in elementary school up to high school, book bags. These book bags are filled with binders, paper, bound notebooks, folders, rulers, a pencil bag, pencils, pens, highlighters, erasers, and hand sanitizer, a news release states. The contents of the book bags are straight from the school supply list that each school district distributes. Morrow County Court of Common Pleas Court Administrator Greg Thomas said that the goal of this program is make sure that all students have the appropriate school supplies. Another part of the grant allowed Juvenile Probation to purchase two new computers and work stations. These computers permit youth that need computer access, but may not have it at their homes, to have computers available when needed. The computers are designed for students that are educated through online programs, or need computer access to complete homework assigned by a brick and mortar school. In addition, the computer work stations are used for those who are studying for their GED diplomas, as well as those who are applying for employment. Thomas said, “Many employers are now requiring applicants to apply online. For those that do not have their own computers, now they have these work stations to use”. The Juvenile Probation Officers will again this school year be hosting the Study Group program. Beginning on Sept. 13, study group at the Morrow County Courthouse will take place every Wednesday from 3:30-5:30 p.m. The study group is open for any student of a Morrow County school. The program is designed to provide students tutoring for any area/subject that they need assistance with. Online work and GED preparation work can also be completed during this time. “These worthy programs are available because Judge Hickson, Judge Elkin, and our Court staff genuinely care. We all truly want to see success from the youth. If this assists them in achieving success, we are all in,” Thomas said. For information contact the court at 419-947-5512.